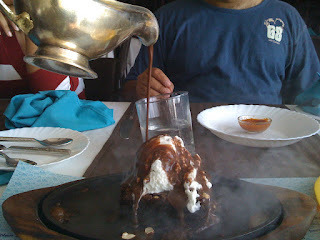 Over the past eight years in Bangalore, Sudhakar and I have visited a number of restaurants. 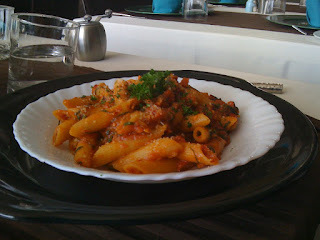 Few have remained on our list of 'anytime visits' and Bangalore Bistro on Brigade road is one of them. Many people would be familiar with their Cunningham Road branch. Though we have not visited this place ourselves, we are more than content with the Brigade road branch. One of the main things it has going for it is the friendly staff. In fact Anoushka is good friends with all of them and even with the resident cat. She gets her own 'special chair' as well as plate and cutlery which keeps her mighty happy and out of our hair. Their menu is extensive and the choice is from Continental, Arabian, Italian and a bit of French for good measure. We have tried most of what is there on their menu and have now graduated to telling them what ingredients we would like used and they unfailingly come up with a great dish. This time round, Sudhakar asked for something that was cooling and refreshing to drink. Out came a cocktail which had chilled lemon water with a touch of crushed mint, a dash of Bacardi and a wedge of line. The glass was topped off with lots of crushed ice. And you could see bliss settle all over Sudhakar's face. 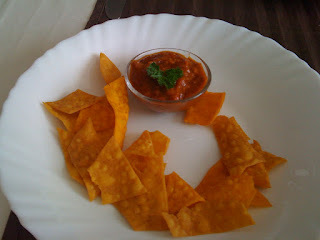 Complimentary nachos with a tomato-garlic salsa are always served and we get an unlimited supply thanks to Anoushka's love for the same. Among their starters - two which come to mind off the top of my hat are the chicken aniseed which is flavourful as it is well presented. Also not to miss are the cheese and jalapeno balls which are a wonderful mix of cheesy and tangy. Their hummus too is excellent, though you want to order an extra round of bread for it. As for main courses - Sudhakar almost always opts for the 'My Salad Days' which is unlimited helpings from their salad bar along with soup of the day and garlic bread. This time round, the garlic bread came with bits of garlic on it adding an extra crunch to the toast. 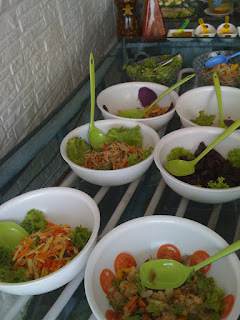 The salad bar is extensive and is a great mix of veg and non-veg, heavy and light dressings. There is mix of greens, pastas, coleslaws and more. What is great to look at is the salad bar which are rows of bowls set on cooling aparatus that is shaped and designed to look like sea waves. 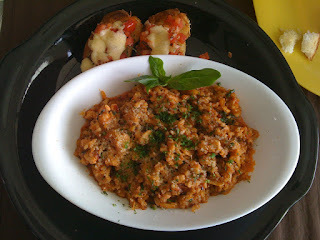 I love Italian and while I vouch that the pastas here are good, I would still prefer their risottos over their pastas. And so I ordered their piquant tomato and chicken risotto. However, if you are not a major fan of crushed black pepper, please do tell them in advance to lay off the ingredient else you will be have a risotto laden with black 'spicyness'. This is served with a cherry tomato version of garlic bread, which many will like. Our friend ordered their penne pasta parmigiani, which was I assume was delicious since she got through it in 10 minutes flat. The pasta came steaming hot and with a side of garlic bread. We both also ordered ice tea which are not the bottled variety and come in glasses big enough to make the difference it should. For dessert this time around, they did not have the blueberry and strawberry cheesecakes that are a piece of heaven and so we opted for the sizzling brownie. 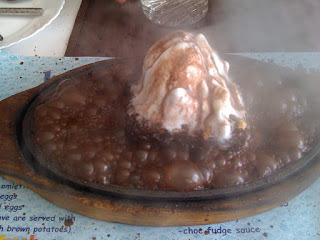 And man did the brownie sizzle when the chocolate sauce was poured on it. This place is excellent for when you want a long luxurious meal, good music and a great ambience. They also have outdoor seating which is great during the night, candlelight and all. Despite being on Brigade Road, you barely hear the constant drone of traffic down below. Beer and wine is served here and the bill inclusive of 2 starters, 2 drinks and one main course per person for 2 generally works to within Rs 1300. Some of the other great things to try are the Lebanese Sheesh Touk, the Ba-pe-tu Chicken and the Oreo milkshake.